This book covers the different aspects, such as patents, trademarks and copyright of Intellectual Property (IP) from a more practical business perspective. 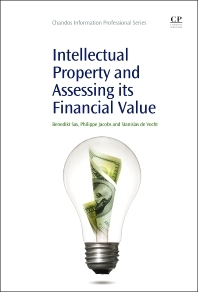 Intellectual Property and Assessing its’ Financial Value describes the differences between regions, mainly the differences between the US and EU. In addition, several tools are presented for assessing the value of new IP, which is of importance before engaging on a new project that could result in new IP or for licensing purposes. The first chapter introduces the different types of IP and illustrating the business importance of capturing and safeguarding IP, the second chapter discusses patents and other forms of IP with subsequent chapters exploring copyright and trademarks in more detail, and a concluding chapter on the future of systems that can assess new IP value. Those involved in innovation and creation of new Intellectual Property. Business developers, marketers and executives involved in licensing, teachers and students in Life Sciences, Economy and Management. Benedikt Sas is Senior business developer (IOF) and has worked at Ghent University since May 2008. He is currently acting as the Chief Business Officer for Food2Know and as a professor in the field of Corporate & Innovation Management. Prior to his position at Ghent University, he was President of the Pharma Business Unit at Kemin Industries Inc. He has invented and been granted numerous patents, and is the author of multiple peer reviewed publications. Stanislas De Vocht started his career as a lawyer at Ghent Bar where he combined his internship with a ManaMa Intellectual Property Rights. In 2007 he started as an in-house legal counsel at UGent TechTransfer, and in May 2013 he became the IP & Technology Transfer manager at iMinds. Philippe Jacobs is an in-house European Patent Attorney of Tech Transfer UGent since May 2010 and is a lecturer at the University of Antwerp. Prior to joining UGent he was director within the IP firm ‘De Clercq & Partners’ and a patent attorney within the tech transfer team of the Flanders Institute for Biotechnology, as well as a patent counsel in the intellectual property department of Innogenetics.